2018 Year End Season of Thanks Bundling Package – Available until Dec. 14! Idaho Programs! Idaho MCLE Approved! Presented in Idaho! With the start of the season of thanks and the end of the year fast approaching, the Idaho Law Foundation, Inc. and Abila would like to assist you in getting self-study credits. 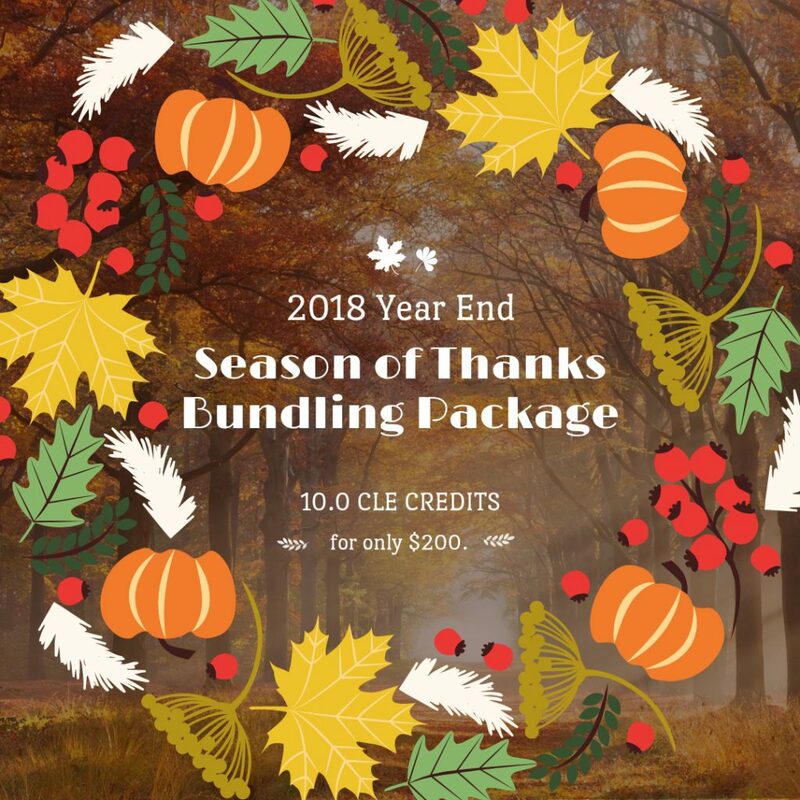 Between November 19th and December 14th, you may purchase the Year End Season of Thanks Bundling Package, which includes 10.0 CLE credits for only $200! You will be given 90 days to make your program selections, with an additional 90 days following your selection to view each program. By selecting online, on-demand streaming, you will have the convenience to watch whenever and wherever you like! Please Note: You will not be eligible to receive additional credit for the CLEs listed above you have attended or rented in the past. No refunds will be provided. No extensions will be awarded. All sales are final. Your support of Idaho Law Foundation CLE programming provides the necessary resources to fulfill the Foundation’s goal of enriching the public’s understanding of and respect for the law and legal system. To take advantage of this great offer, select: 2018 YEAR END SEASON OF THANKS BUNDLING PACKAGE – ENDS FRIDAY, DECEMBER 14!